In the heart of the Ljubljana art street, 50m from the dragon bridge and 200m from the main square and three bridges. Perfect for larger families or group of friends. 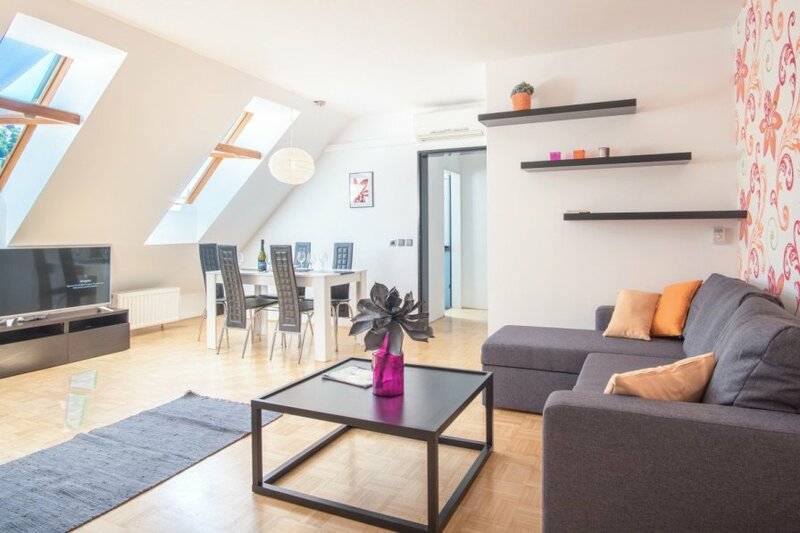 An attractive duplex loft apartment with lots of light offers amazing views of the Ljubljana Castle. On the first floor there is a fully equiped kitchen, large living room with flat screen TV, dinning room, two bedrooms (one with double bed and one with two single beds) and a bathroom, decorated in Oriental style. On the second floor there is a large attractive bedroom under the winter garden with a walk-in closet and attached bathroom with a hot tube, from where at night you can admire shining stars or moonligt. WIFI is available througout the place. There is an inverter air-condition system, as well as central heating. The apartment is decorated with original paintings of Slovenian famous locations, created by the owner's mum. Some hints and tips, what to do in the 0.5 km radius around the apartment. Just off the entrance door, you can enjoy peaceful morning coffee and delicious cake at either Rustica Gourmet or Prince of Orange. Before reaching the end of the street, a 100 meters walk, you can enjoy Lebanese meze, falafel or Aisan specialities. For those who are curious, there is a House of Experiments, just 50 meters away. And before heading to the Prešeren square, there is nothing better than having some more smoothies, something stronger or an early lunch on the banks of the Ljubljanica river at Petkovškovo nabrežje. On the other side of the river, there is a colorful Main Market, open Mondays to Saturdays, where you can buy fresh Slovenian fruit, vegetables or other diod items. The diod market called Open Kitchen is a must. There you can experience the delights of freshly cooked food prepared by different Slovenian chefs right in front of you. On Fridays from mid-March to October, the Open Kitchen offers you an opportunity to meet Slovenian chefs, taste Slovenian and international dishes, and learn about different methods of food preparation. On Čopova street, just off the Prešeren Square, dedicated followers of fashion can shop until they drop. After a long day discovering National gallery, museums, churches, amazing architecture and taking a colorful boat ride on the Ljubljanica river, there is nothing better than a dinner at a highly recommended Čompa restaurant (reservation required), just opposite to your apartment. Beer lovers should not miss Že v redu, Primož craft beer shop, before heading up to the apartment and relax in a hot bath. And if you look after some really good party, head few hundred meters to Metelkova City, an autonomous social and cultural center of the city, and dance till dawn.